Finally, a fun, flexible training program to get you to race day! 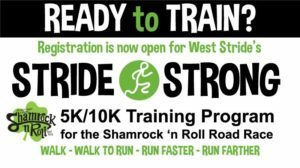 Join us for 8 weeks of training and workouts to prepare you for the Shamrock ‘N Roll Road Race on Sunday, March 12, 2017. Program is open to both men and women and begins with a “Start Your Stride” run & info session on Saturday, January 14th!